I learned about the history of Paris-Brest-Paris from the late Bernard Déon’s excellent book Paris-Brest et Retour (unfortunately out of print). Déon was a great storyteller, and I found his report from the epic 1956 particularly gripping. The main protagonist of that dramatic edition of PBP was a young Roger Baumann. He rode the René Herse shown above through wind and rain, fought off a challenge from a late-charging Jean Lheuillier, and arrived back in Paris as the first of the single bikes. What a story! 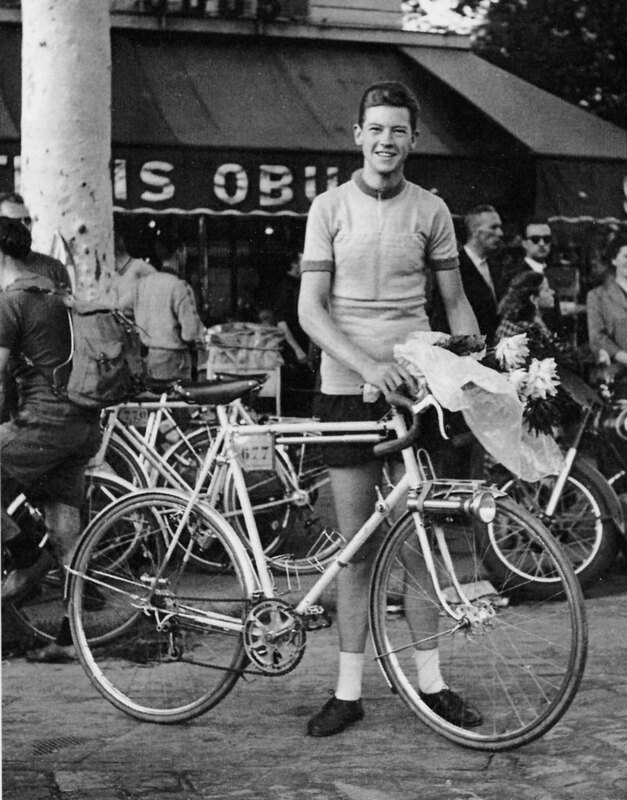 When I asked about his beautiful bike, Roger Baumann told me how he had dreamed of a René Herse bicycle for years: “During my lunch break, I took the Métro to Levallois-Perret, and looked at Herse’s shop window. I didn’t dare go inside.” He told me how in 1952, he bought his Herse with all his savings. He related his excitement when Herse told him later that year: “You are riding well. 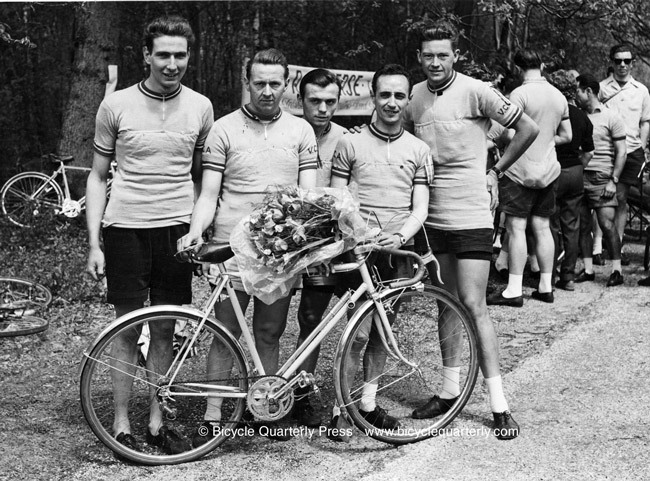 From now on, we will equip you.” Below he is part of the winning team at the 1955 Coupe Herse, a 100 km 5-man team time trial (left to right): Boris Brumat, Colliot, Jean-Marie Comte, Gilbert Bulté, R. Baumann. 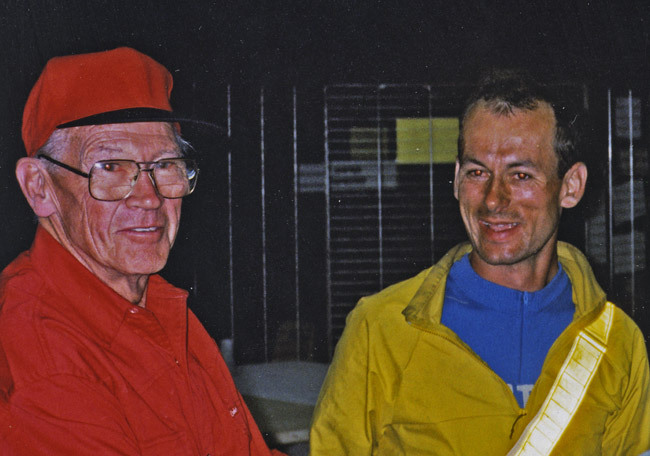 The “Grand Roger” (he got his nickname because he is 6 feet tall) also inspired my riding. I had been discouraged from riding at night by a rainy, miserable Flèche 24-hour ride on a fender-less racing bike. Then Roger Baumann’s told me of cresting the Tourmalet in the middle of the night during the Raid Pyrénéen. He talked of riding long distances non-stop and of carefully planning one’s schedule. This made me realize that I had been missing out on some of what makes randonneuring so special. A few months later, I rode my first 600 km brevet non-stop, and I enjoyed it. From then on, I aspired to become a “grand randonneur,” too. When we arrived back in Paris almost two days later, it was 2:45 a.m. The volunteer checking us in asked, “Are you Monsieur AINe?” Then he yelled, “Somebody get Roger Baumann!” It turned out the “Grand Roger” had asked to be awoken when we arrived. A few minutes later, he arrived and congratulated us (photo above), which made our finish even more special. Two days later, he stood up for us when our trophy for the fastest mixed tandem was claimed by two impostors at the awards ceremony, who ran off with it. In a rush, another trophy was found and presented at the end of the ceremony. Four years later, I was thinking of the 1956 Paris-Brest-Paris again as I rode toward Paris. Not only was this 2007 PBP as rainy and windy as the one 51 years earlier, but I was facing a situation similar to Baumann’s. Even though I was not racing for first place against somebody else, I knew I had to ride all-out if I wanted to achieve the magic sub-50-hour goal. After several hours of all-out effort, I arrived at the final control at the Human Rights Gymnasium in Saint-Quentin totally exhausted. Roger Baumann was there to greet me. I have known Roger Baumann for 12 years now. Lately we have been talking several times a week, as he has helped me tremendously with research for another book. His excellent memory, his passion and his sense of humor make each of those conversations memorable. I look forward to seeing him again in Paris, when we’ll discuss cycling and the world over an excellent dinner. Bicycle Quarterly Vol. 1, No. 2 includes both the story of the 1956 PBP (translated from B. Déon’s book) and the interview with Roger Baumann. This entry was posted in Bicycle Quarterly Back Issues, People who inspired us and tagged cyclotouring, PBP, Raid Pyreneen, randonneuring. Bookmark the permalink. Is there anything a randonneur needs more than the address of a very nice bench? What a warm and wonderful story. Looking forward to the forthcoming book. this person. Others such meetings are the beginning of life long cycling relationships. Thanks for the fascinating write-up and behind the scenes look. These types of stories are my favourite part of this website and Bicycle Quarterly. Same here. There’s nowhere else to find these stories, that I know of.